Cecil Fielder was a noted power hitter in the 1980s and 1990s. He attended college at the University of Nevada, Las Vegas (UNLV). He played with the Toronto Blue Jays (1985–88), Hanshin Tigers (1989), Detroit Tigers (1990–96), New York Yankees (1996–97), Anaheim Angels and Cleveland Indians (both in 1998). In 1990, he became the first player to reach the 50-home run mark since George Foster hit 52 for the Cincinnati Reds in 1977. His new fans nicknamed him "Big Daddy" for his big smile, peaceful temperament, and prodigious home runs (as well as his massive physical stature). 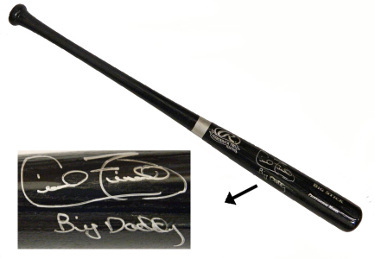 Cecil Fielder has hand signed this Rawlings Black Big Stick Bat with Big Daddy inscription. Schwartz Sports Hologram and Certificate of Authenticity from Athlon Sports Collectibles.